A delicious coffee-time treat for friends. 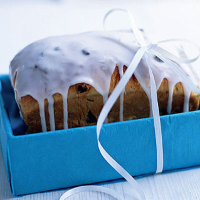 Once the icing has set, wrap the bread loosely in Cellophane or parcel it up in a paper-lined gift box, tied with string or ribbon. Pound the cardamom pods, using a pestle and mortar, to release the seeds. Discard the pods and grind the seeds to break them up. Tip into a bowl and add the lime zest, flour, yeast and caster sugar. Add the butter to the bowl with the egg yolk and milk. Mix with a round-bladed knife to make a soft dough, adding a little more milk if the dough feels dry. Turn out onto a floured surface and knead for 10 minutes until smooth and elastic. (Alternatively, use a free-standing mixer with a dough hook attachment, kneading for 5 minutes.) Turn the dough into a lightly oiled bowl, cover with clingfilm and leave in a warm place until doubled in size. Grease a 500g loaf tin. Put 25g of the pistachios in a food processor with the ground almonds. Blend until the pistachios are ground and the mixture is pale green. Add 40g of the icing sugar and the egg white. Blend to a thick paste, adding a dash more egg white if the paste is very crumbly. Tip onto the surface and roll into a cylindrical shape, slightly shorter than the length of the tin. Tip the risen dough out onto a floured surface and knead in the whole pistachio nuts and the sultanas until evenly distributed. Flatten out the dough under the palm of your hand, until it is large enough to roll up around and completely enclose the pistachio paste. Press down into the tin with the join underneath and cover loosely with oiled clingfilm. Leave in a warm place until the dough has risen to the top of the tin, about 45 minutes. Preheat the oven to 200°C, gas mark 6. Bake for about 25 minutes until risen and golden. Tip out of the tin and tap the base. If it sounds hollow, the bread is cooked. If not, return to the oven for a little longer. Leave to cool on a wire rack. To decorate, mix the remaining icing sugar with the lime juice to make a smooth paste. Drizzle over the top of the bread with a teaspoon to decorate.